Getting to the Gold Coast couldn’t be easier, situated in South-East Queensland the Gold Coast is serviced by two major international airports and has effortless road access from Queensland’s capital, Brisbane. The Gold Coast Airport is at the centre of Australia’s favourite beach holiday destination, the Gold Coast. The airport is situated 25 kilometres south of the tourist hub of Surfers Paradise/Broadbeach and just 5 minutes from Coolangatta. Gold Coast Airport is also the gateway to the Tweed Region of Northern New South Wales featuring Byron Bay - located under an hour away by car. Gold Coast Airport operates on Australian Eastern Standard Time year round. Gold Coast Airport welcomes more than 350 direct flights each week from many destinations including Sydney, Melbourne (Tullamarine and Avalon), Cairns, Adelaide, Perth, Canberra, Newcastle, Rockhampton and Townsville. International destinations include Singapore, Kuala Lumpur, Wuhan (China), Narita-Tokyo (Japan), Nadi (Fiji) and in New Zealand – Auckland, Christchurch, Wellington and Queenstown. Whether you’re travelling alone or with friends and family, Gold Coast Tourist Shuttle will get you from door to door. The Gold Coast Tourist Shuttle services from Tweed Heads in the south through to Runaway Bay in the north. For reservations or enquiries call 1300 655 655 between 7:00am and 7:00pm or visit Gold Coast Tourist Shuttle for more information. •	Route 760 connects the airport to Varsity Lakes Train Station, departing half hourly. Surfside also operates buses to Kingscliff and Pottsville from Tweed Heads and Murwillumbah. Visit surfside.com.au for more information. Visit translink.com.au or call 13 12 30 for more information or to plan your journey. The taxi rank is conveniently located at the front of the terminal. The Car Rental desks are located opposite the arrivals area. 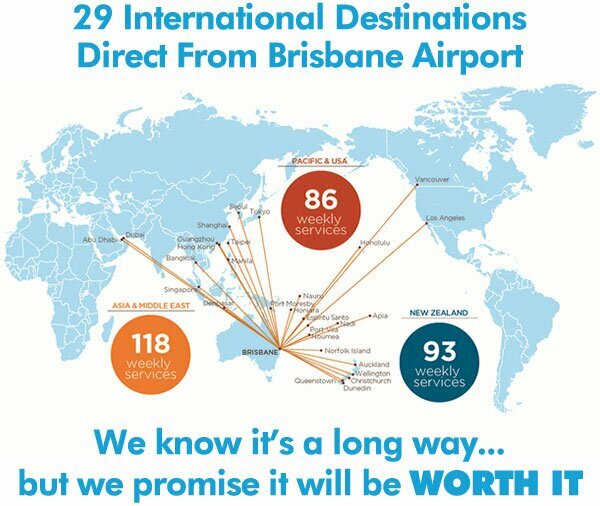 Brisbane Airport operates 24 hours a day, seven days a week and has two major terminals servicing 30 airlines flying to 79 destinations. Brisbane Airport is a suburb in its own right, the largest airport in Australia by land size (2,700 hectares), the third busiest capital city airport in Australia by aircraft movements (217,436 for the 2016 financial year) and the third largest airport in Australia by passenger numbers with more than·22.5 million passengers travelling through the airport in the 2016 financial year. Most airlines fly out of Brisbane, to see a list of them have a look here. Airtrain Connect special INTELEC 2017 price: $90 return (station price $110 return). $46 one way (station price $56 one way). Con-x-ion Airport Transfers meet every flight arriving into Brisbane Airport seven days a week, offering one way or return 'door-to-door' coach services from the Airport to/from Brisbane city, the Gold Coast and the Sunshine Coast. In addition to scheduled services, Con-x-ion also provides private bus charters on request. Con-x-ion Airport Transfers provides services to the Gold Coast, door-to-door from Sanctuary Cove to Coolangatta, east of the Pacific Highway.